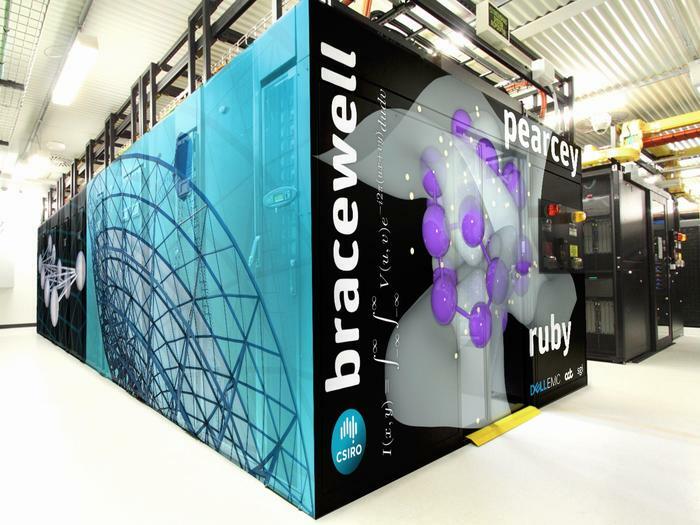 The CSIRO’s new supercomputer — dubbed ‘Bracewell’ after astronomer and engineer Ronald N. Bracewell — has gone live. The $4 million system was installed in five days during May and June, and entered production earlier this month. The system is based on 114 Dell EMC’s PowerEdge servers equipped with dual Xeon CPUs and NVIDIA Tesla P100 GPUs, with 100Gbps Mellanox EDR InfiniBand networking. In total, the system has 3192 Xeon cores, 29 terabytes of RAM and more than 1.5 million CUDA cores. Early users of the system include Data61’s Computer Vision Group, which is working on a bionic vision system. “When we conducted our first human trial, participants had to be fully supervised and were mostly limited to the laboratory, but for our next trial we’re aiming to get participants out of the lab and into the real world, controlling the whole system themselves,” said Data61’s Nick Barnes. “To make this a reality, we need to build vision processing systems that show accurate visualisations of the world in a broad variety of scenarios,” said Barnes, who is an adjunct associate professor with the Australian National University. “This new system will provide greater scale and processing power we need to build our computer vision systems by optimisation of processing over broader scenarios, represented by much larger sets of images, to help train the software to understand and represent the world,” Barnes said.